North Queensland sugarcane and essential oil derivatives could be turned into pharmaceuticals, agrochemicals and even luxury perfume, in ground-breaking research by JCU researchers. North Queensland sugarcane and essential oil derivatives could be turned into pharmaceuticals, agrochemicals and even luxury perfume, in ground-breaking research by James Cook University researchers. 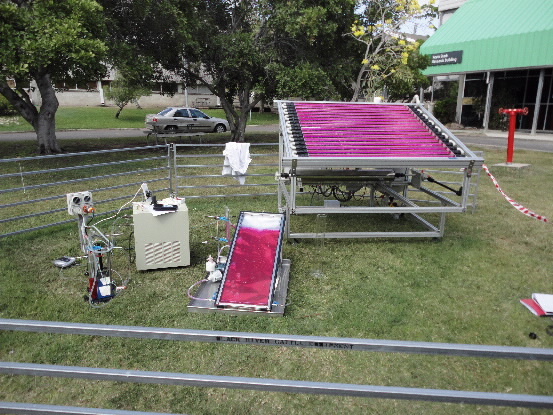 Matthew Bolte, from JCU’s Solarchemicals Research Group in the School of Pharmacy and Molecular Sciences, is using sunlight to photo-chemically convert biomass derivatives into materials that are both naturally derived and produced with renewable energy. “We are investigating a way to take advantage of JCU’s tropical location and sustainable derivatives from the sugarcane and the essential oil industry,” Mr Bolte said. Mr Bolte said the Solar Chemicals Research Group, headed by JCU’s Associate Professor Michael Oelgemoeller, was responding to current challenges in the sugar industry. “Environmental and economic pressures on the sugar industry has caused them to diversify,” he said. Furfural is a sugarcane bagasse derivative and is used worldwide in the plastics and paint industry to replace chemicals currently derived from fossil fuels. A furfural plant was being constructed alongside the Proserpine Mill, and the project’s ultimate aim was for a solar reactor to be also set up at Proserpine to use the furfural on site, Mr Bolte said. Similar pressures to the sugar industry were being placed on the essential oil and fragrance industries, with many perfume houses and customers demanding more environmentally-friendly ingredients, he said. Mr Bolte said the team’s first project was converting furfural to a higher value platform chemical, 5-hydroxy furanone. “This can then be used as a building block for biodegradable surfactants, agrochemicals and pharmaceuticals,” he said. Mr Bolte said the sustainability credentials of the project were further enhanced in that all the solar chemistry had been developed to be carried out in the renewable solvent ethanol. Work began in the laboratory in June this year and projects have moved from laboratory scale (500mls) to a small scale manufacturing size in a 50L purpose-built solar reactor. “We are hoping to improve the process on the 50-litre scale to enhance the economic and environmental viability of the concept. Mr Bolte said the project, funded by a JCU Pathfinder Grant, was breaking new ground in the Australia green chemical market.